I had fun with my Silhouette last night and made a couple Valentine’s Day shirts. Today’s post is a great shirt for kids (come back tomorrow for a shirt for teens and adults). 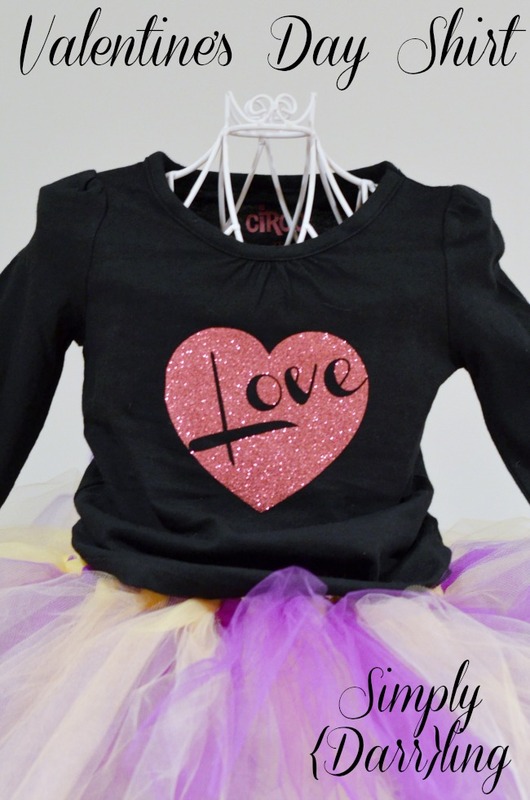 To create this shirt, I started with a basic heart shape in my Silhouette Design Studio. I then added the “Love” in Channel font and rotated it to go diagonally across the heart. I subtracted the Love from the heart to make it a single shape then set it to cut the outline. Make sure you mirror the image for Heat transfer vinyl! I’ve forgotten this step a few times. 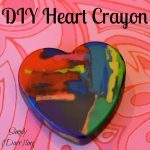 Want to make one yourself? The .studio file can be downloaded here. 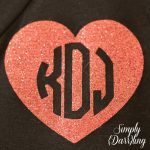 This glitter heat transfer vinyl is so much fun to work with and adds a little extra oomph to each project. For a little kid, this shirt is something that could probably be worn multiple times and not just in February. 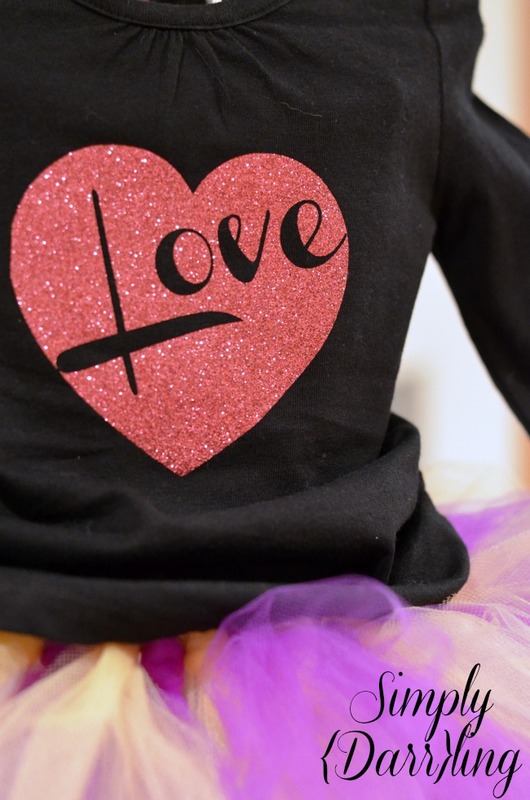 Do you put your kids in Valentine’s Day outfits? What do you wear yourself? I totally thought this was storebought before I realized it was a bit of a tutorial. So awesome!!! You have mad skills, haha. That glitter heart is awesome, too. Good job! Thanks! Everything is better with glitter. I want you to make this for me!!!!!!!!!!!! I LOVE it! Thanks! I can send you the iron-on if you want. I was scared of the heat transfer until a couple months ago. My first few projects didn’t go well. I want one in my size! Love it! I need to break out my Silhouette! I’ve yet to try the heat transfers! Thanks for the inspiration! Feel free to use the file linked! Let me know if you make one; I’d love to see it. That’s so cool that you made that! I LOVE this shirt! Super cute and so so creative! 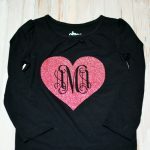 Love the glitter, my girls would totally wear this shirt! Saying hello from kitchen fun and crafty Friday! Thank you so much for attending week 17 of #PureBlogLove and linking your fantastic blog post, I can’t wait to see what you have in store for our next party, Thursday 8 PM EST- Sundays at midnight. 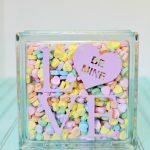 Your post has been added to the #PureBlogLove Pinterest board for all to see :) Have a great day! This is absolutely darling! I would love to make one for my lil’ lady bean. :) And I included this in my top 5 Sunday Funday picks! My daughter would love this! Thank you for sharing on Show Me Saturday! so adorable! I think that is a perfect heart for all girls – regardless of age – for valentines and year round wear. Who doesn’t love a little glitter and glam! I really need to get a silhouette. I have a cricut expressions and unfortunately you can’t do much with the software, boo! I want one too! So cute! Thank you for sharing with us at Snickerdoodle Sunday! Pinned and tweeted. Very sweet shirt. Thank you for sharing on Merry Monday! Pinned Have a great week! How fun! This shirt will look so cute on my granddaughter! And her moms name is Kendra. Thanks for sharing@ Best Friday Features.